The word ‘team-building’ can often fill your audience with sudden dread. Despite its bad reputation, team building is vital for building trust, communication, and teamwork between a group of people. In addition, team building activities tend to improve group engagement, which leads to happier participants and higher retention rates. Team building activities can take many formats, including structured games and activities or something as simple as a group outing to the movies or a ropes course. With a little planning, it’s easy to incorporate team building activities into 4-H club meetings or programs. 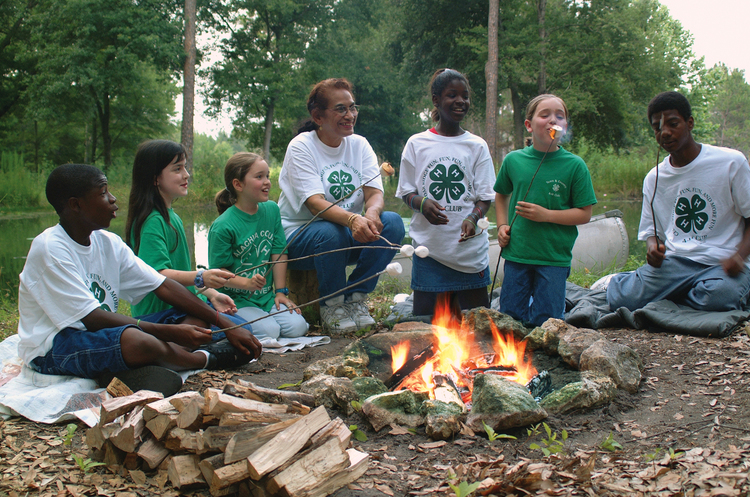 Every proper 4-H club meeting includes three parts: business, education, and recreation; fun, engaging activities that help to improve teamwork skills easily qualify as recreation. A quick internet search will provide you with hundreds of ideas for activities, but we’ve compiled a few tried and true ones for you below. They are sure to be a hit in any club meeting! Rules: Have everyone stand in a circle facing each other, shoulder to shoulder. Everyone should then put their right hand out and grab the hand of a random person across from them. Then, tell everyone to put their left hand out and grab another random hand from a different person across the circle. Within a time limit that you set, the group must untangle the knot of arms without releasing any hands. If you have a particularly large group, split them up into smaller circles and have them compete against one another. Objective: This game relies heavily on good communication and teamwork, and encourages everyone to interact with someone that they may not normally interact with. Rules: Divide your group into pairs. Have the pair of individuals sitting with their backs against each other. Give one person the pen and paper and hand the other person a simple picture. The person with the picture should describe the image to their teammate, but should refrain from saying exactly what it is. For example, if the image is a worm in an apple, do not say, “Draw an apple with a worm in it.” The person with the pen and paper draws what is described to them. Set a time limit for 10 – 15 minutes. Objective: This activity focuses on interpretation and communication. Once the drawing is complete, it’s always interesting to see how the drawer interprets their partner’s description. This activity is particularly helpful when you’re encouraging your 4-H members to interact with new people. Rules: Split your participants into even groups. Prior to your club meeting, pick four (or more) random objects for each group. Describe a scenario to each team where they need to solve a problem using only the objects given to them. Some examples include stranded on a desert island or saving the world from an alien invasion. Each team should come up with a story explaining how they will use their objects. They should also rank the objects in order of usefulness based on the scenario. Objective: This exercise helps to foster creativity and problem solving. Try to make the scenarios challenging, but age appropriate so it’s fun for everyone participating. Tools Needed: Tape, a pen, a small piece of paper for each employee and a list of well-known pairs (think peanut butter and jelly, Mario and Luigi, or salt and pepper). Rules: Write one half of each pair on the sheets of paper (Mario on one piece, Luigi on another, and so on). Tape one paper to each person’s back, then have everyone mingle and try to figure out the word on their back. The rule: they can only ask each other yes or no questions. Once they figure out their word, they need to find the other half of their pair. When they find each other, have them sit down and find three things they have in common while the rest of the team continues. Objective: This exercise improves youth’s communication skills, creativity, and problem solving. Rules: Using the tape, mark off a section of the floor. Have the entire group stand inside of this space. Begin to slowly shrink the space, and tell the group that they must all continue to remain inside of it. Everyone will need to work together to keep everyone inside of the shrinking space. Objective: This game promotes physical activity, critical thinking, creativity, problem solving, and teamwork. Rules: Using just these supplies, which team can build the tallest tower? There’s a catch: the marshmallow must be at the very top of the tower, and the whole structure has to stand on its own for at least 5 seconds. Provide a time limit to make this activity even more challenging! Objective: This exercise promotes creative problem solving and collaboration. ← There is a cat in my yard!